We are deluged by facile arguments and factoids designed to 'manage' the Scottish question, or to rig the terrain on which it is contested. Before we get used to the parameters of a bogus debate, there must be room for more honest and nuanced thinking about what 'independence' means in and for Scottish culture. This book sets the question of independence within the more radical horizons which inform the work of 27 writers and activists based in Scotland. Standing adjacent to the official debate, it explores questions tactfully shirked or sub-ducted within the media narrative of the Yes/No campaigns, and opens a space in which the most difficult, most exciting prospects of statehood can be freely stated. Its declared intention, then, is to raise the level of the independence debate. Its immediate effect, predictably enough, has been to lower it further, with a somewhat uncharitable and highly selective reading of Alasdair Gray's contribution being met by a prickly response from Kevin Williamson and Mike Small. [Update: more here.] But that's only to be expected, and in the longer term the book bids fair to meet its publishers' hopes and vindicate its editor's efforts, undertaken 'for the sake of curiosity and in the interests of posterity'. The current independence debate is -- beyond its widely deplored and even more widely indulged tetchiness, pettiness, and point-scoring -- a bit artificial and accidental. There's been no recent surge of sentiment for independence. Scotland is having an independence referendum in 2014 because the SNP won a quite unexpected majority of seats in the 2011 election to the Scottish Parliament, and was committed to calling a referendum if it had the power to do so. More than likely, the SNP never expected to have to deliver on this so soon: the electoral system was set up more or less deliberately to prevent any one party being able to govern on its own, and in any coalition negotiations the referendum plank would have been the first and easiest to break. As it is, they're stuck with a massive distraction from the job that made most of their supporters in the 2011 election vote for them in the first place: being a fairly popular and competent governing party in the devolved parliament. But you play the hand you're dealt. To have the future of the state a topic at all is something. Unstated is an attempt to seize the opportunity for a serious conversation about what kind of society we want. It's not in itself that conversation: each of the contributors wrote without knowing what the others were saying, or indeed who they were. No claim is made that the 27 authors represent anyone but themselves. On this reckoning, a majority of writers here would vote for independence, and most if not all of these would hold out for a more radical polity and settlement than that offered by the SNP. (As would, I think, most of those ambivalent or against.) This distribution of opinions is pretty much the exact inverse of where the wider public stands at the moment. Whether this indicates that the writers sampled are ahead of the curve or just out of step remains to be seen. As a southern Englishman, or more accurately Cornishman if we are going to be all ethnic about it - but wait, my family name comes from Dartmoor which would make me Devonian, except for my maternal family which are N. English, well apart from my maternal grandfather who was from the Highlands - hang on, now I've lost the thread. Oh yes, English colonisation of Scotland, that was it. Weeell, my boss in an iconic London Institution was a Scot, my neighbour was a Scot, my assistant was a Scot, etc etc. Are Scot's in London more immigrant than Cornish, or Irish, or ... whatever. Very nearly half of the population of London aren't even from the British Isles but, you know, that is what makes it one of the most vibrant and successful cities in the world. Whether the people in Scotland want political independence is a matter for them. They sure as hell won't have economic independence. The UK lacks that. However, I hope talented Scots will still come south to enrich southern England. Maybe an equivalent book by English writers would be useful. Without the tail-wagging influence of our reflexively statist neighbours North of the border, there may be more of an opportunity to re-frame our own political narratives. Can't wait to read this. I just ordered it today. I agree, John. But it may be a sign of something wrong that people from Scotland do better outside Scotland, including in England, while within Scotland a lot of the middle and top admin jobs go to people from England (and elsewhere). At least that's my anecdotal impression. Anon - yes, that's one argument for independence, which in my gloomier moments I might agree with. Gray's "colonist" comment was quite precisely aimed - at English people who come north not intending to stay, with a view to either getting promoted back to England or at worst retiring to England. Not so much "colonist" as "civil servant on colonial posting". From Mill and Carlisle on down, the pattern for Scots coming south has been more straightforward migration, which (where English migrants are concerned) Gray doesn't object to. Those slightly shouty types at Bella Caledonia are right - it's absolutely not an "anti-English" rant, or even anti-incomer. As should perhaps not be surprising from Alasdair Gray, it's a subtle, intelligent and well-founded argument, delivered in the form of a rant. Deborah Orr, on the same subject. Sorry,Phil, but to disparage as colonists 'English people who come north not intending to stay' is anti-English and reactionary. It's an attack on the free movement of labour (albeit in this case middle-class/professional labour) within a common economic space and within what is still one state. I've read Gray's essay and I appreciate that its nuances have been (entirely predictably) ignored, but I still think he's completely wrong. The book sounds interesting and the 'anti colonist' rant familiar. As a Canadian, I have heard complaints about foreign workers "coming here and taking our jobs" (only justifiable if they are forced to work for less than the natives); as a Western Canadian I have heard complaints about Easterners "coming here and taking our jobs"; as a someone from New Caledonia, I have heard complaints about people from the South "coming here and taking our jobs". This seems to be a universal moan and possibly just reflexive nativism. Although I may be missing the point in the Scottish context. I did have some fun with a Western Canadian separatist from Alberta some time ago, though. She was ranting on about the eeeviiil Easterners taking advantage of us poor, hard done by Western Canadian. I pointed out that she WAS an Eastern Canadian, something she flat out could not understand, even when I took out a map and pointed out that she was, as a matter of geographic fact, an Easterner as far as I and other denizen of the Pacific Coast were concerned. i don't know a goddamn thing about scotland. i have a scottish-american lover, if that means anything. but i do feel the passion for regionalism. i'm confused and concerned about it, frankly. it's damn easy, and at the same time silly, to believe or deflect the notion that "if we could just be on our own, all our problems will be solved." this is actually an ongoing argument at a blog with which i was once associated. true progressives in many american regions have wondered, vocally: should we just give up and not waste any time on the national coalition concept? i don't have the answers. i still think about it a lot. i have worked in polity based organizations in urban, rural, suburban and exurban situations. there are flaws in each. some can be dealt with, even as there are harsh realities that need to be addressed in the same. i may be using one of those right now. love your show, ken, btw. like, srsly. you are The Man. > It's not my place to review a book in which I have an essay, but it is my place to plug it. chicago dyke - maybe 'progressive' and 'radical' are two terms that haul too much baggage? They certainly don't have widespread appeal, and for good reason. "Unstated is an attempt to seize the opportunity for a serious conversation about what kind of society we want." But unfortunately it's also currently out of print. Tychy - I don't think that's entirely fair, given that Word Power is a small independent publisher and that as far as I know Unstated is its first non-fiction book. And 'out of print' is not the same as 'currently reprinting'. The book should be available again very soon. Well, I am from a generation that downloads everything, immediately, for free. I can't remember the last time I was unable to get my hands on a particular book. But Word Power say it will be making a reappearance in under 2 weeks. I got mine, just in time. Interesting stuff, and really enjoyed the pieces in there by two of my own favorite novelists, a certain Ken MacLeod and James Robertson. 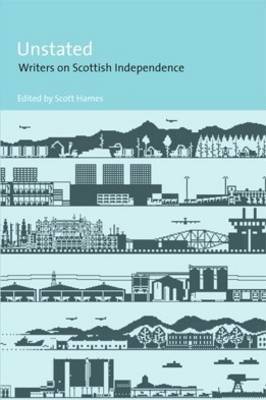 Will probably inflict both essays on the unsuspecting students in my Modern Scotland class at Evansville! Aw - thanks James! Have you read 'And the Land Lay Still'? Reading it as we speak. Slowly so as not to get it done too fast. I LOVE Gideon Mack, The Fanatic and Joseph knight, and have foisted them all on many people here.